Starting at the front entry, I’ve crafted a welcome from some greens and bits of vintage jewelry pulled from my dressing table. 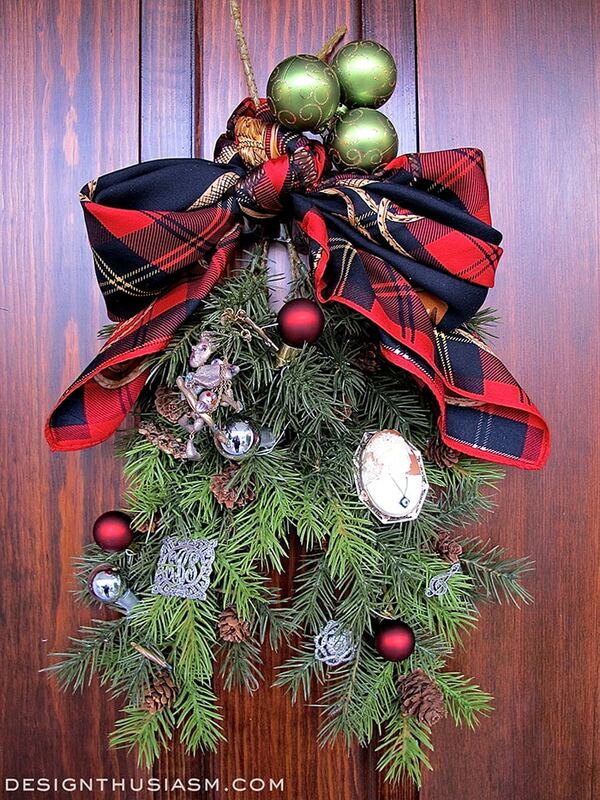 You can see the details of this homemade “alternative wreath” by visiting Bejeweled Greens, so let’s continue inside. I’ve already done a few posts on several corners of my home, which I’ll link to at the bottom, so today’s post will concentrate mostly on the living room. While I like my seating to be very comfortable, many of my hard pieces tend to the more formal side. 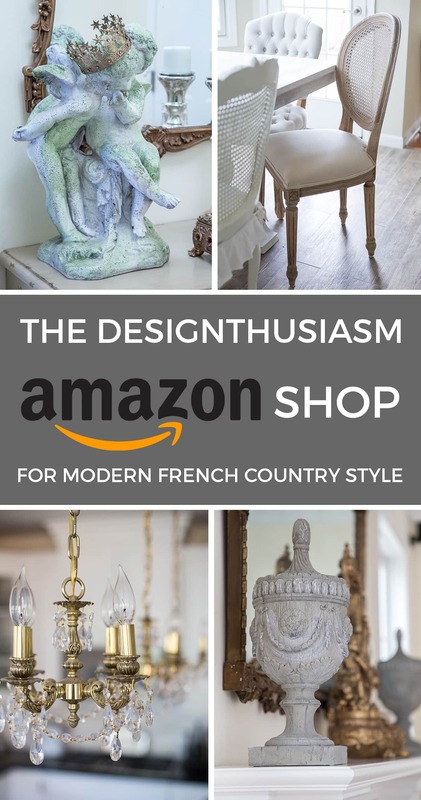 I love antiques, especially English and French, so this vignette is set on top of an antique chest beneath a French trumeau mirror. I think my defining style is the contrast of aged patina against glimmery jewel-like decor and this very chippy garden statue satisfies that quest perfectly when matched with the silver tea service. 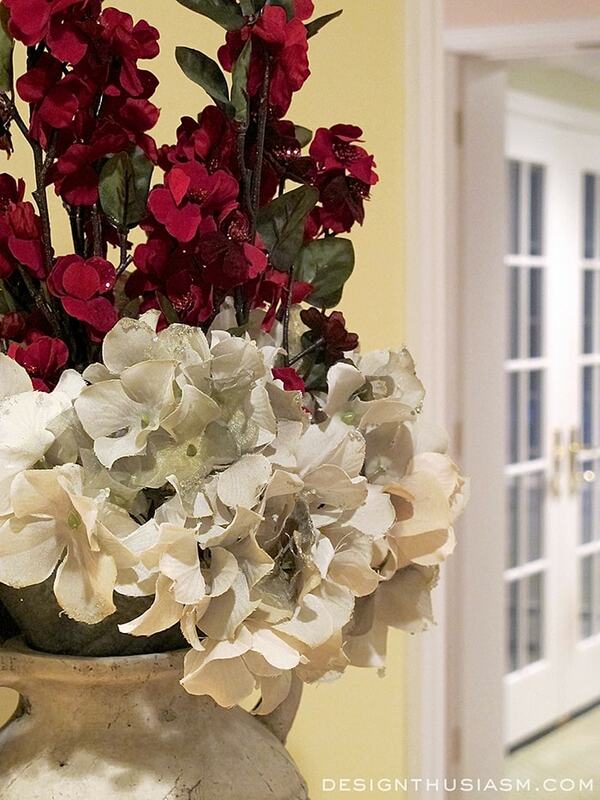 One of the first things I did this season was define my color palette which is epitomized here in these silk flowers. I’m not a huge fan of tomato red with kelly green and knew from the start I wanted to stay as close as possible to a bluer claret type red and a green somewhere between celery and sage. After that, it was all snowy whites and shimmery silvers and golds. I’m not a matchy-matchy girl either, a left-over design philosophy from my days designing sportswear. So even in this tea service, rather that putting out the matching pieces (which I do own), I instead brought together disparate pieces bought on separate trips to various places. You can read about the teapot here, my most recent acquisition that was a tarnished mess when I first found it at an antique mall in Indiana. One of my other favorite elements in any decor grouping is the inclusion of embroidered white linen which signals to me refined beauty. 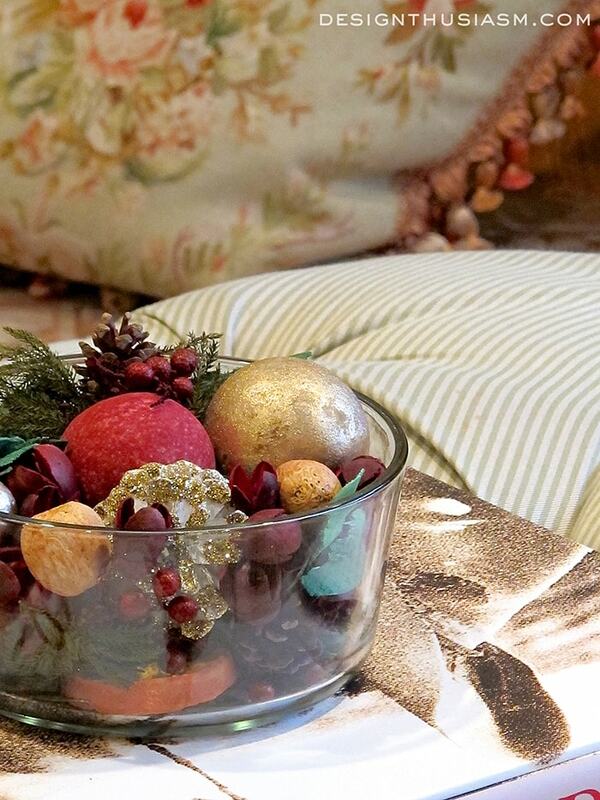 What better place to highlight a cluster of berries, pine cones and greenery? While I love to highlight the visual, I think any well appointed home must give attention to other sensory pleasures. I’m a huge potpourri fan and I find it delightful to enter a home and be welcomed by the seasonal aromas offered by such a small bowl full. 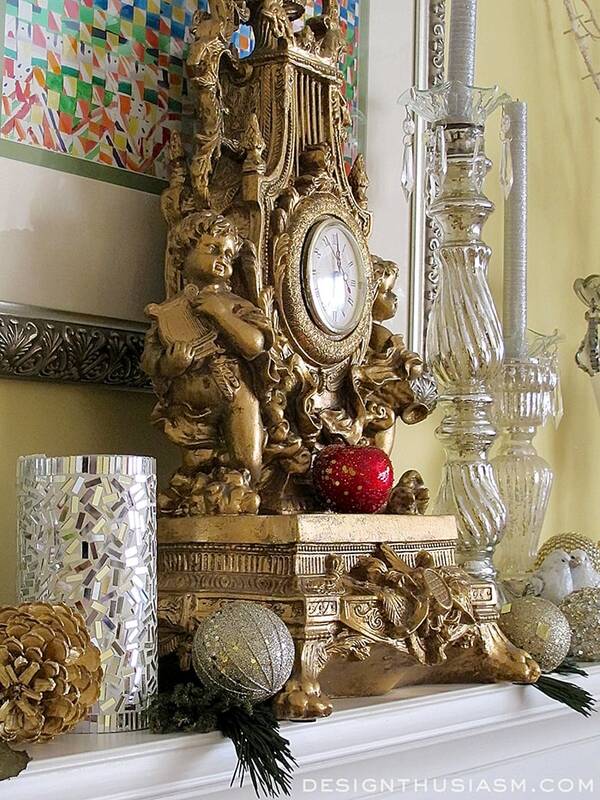 Here you can get a glimpse of the mantel but I’ll show a little more later, where you can link to a detailed post on my entire mantel decor. 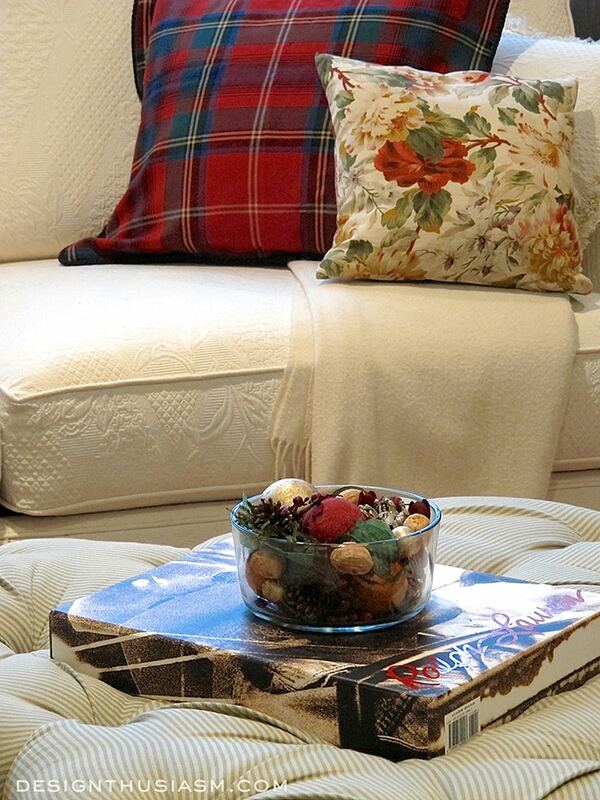 On the couch I’ve changed up my pillows for the season to add a punch of plaid. This room spends most of the year dressed in pastel tones but the neutral cream sofa made it easy to add in some vibrant color. 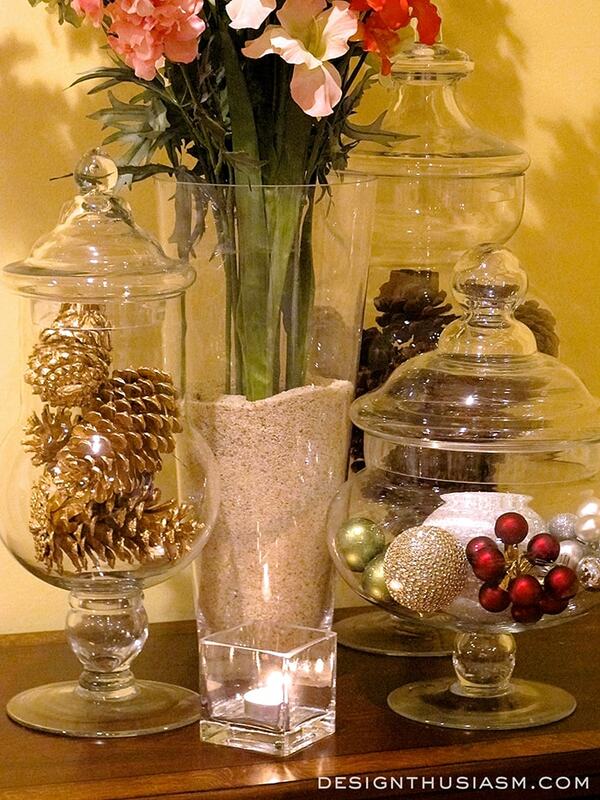 In the corner I filled my apothecary jars with gilded pine cones and holiday ornaments. 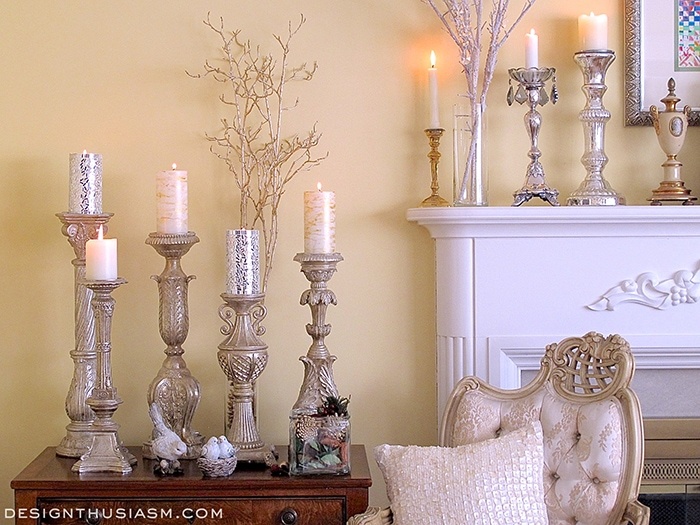 A candle adds light and warmth, always a privilege in the winter months. I keep candles throughout my home in various containers and holders. Below you can see another corner I brought to life with the addition of candlelight. You can see the remainder of that post by clicking on A Candlelit Corner. I’ll add a few more views of the living room before I move on to the links to the other rooms. I always enjoy mixing patterns for a note of sophistication and complexity. 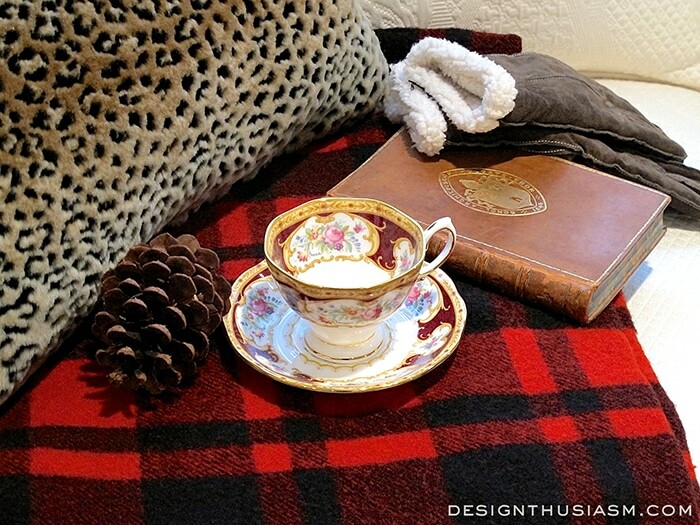 The cheetah pillow is always part of this room but I love the way it works with the classic plaid blanket. 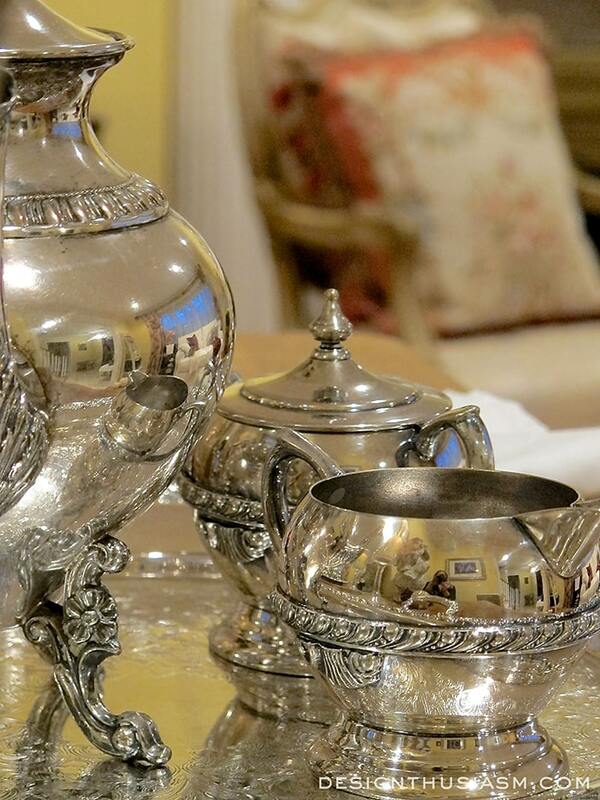 A close up reveals the differing details on the silver piece embellishments. My makeshift “wreath” waiting to be hung. 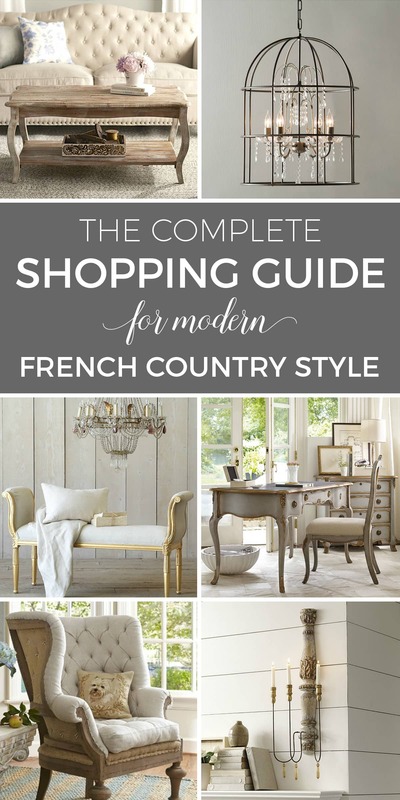 One of my very favorite pieces in my entire collection is the French trumeau mirror below. It’s from the 1700’s and is truly something I treasure. 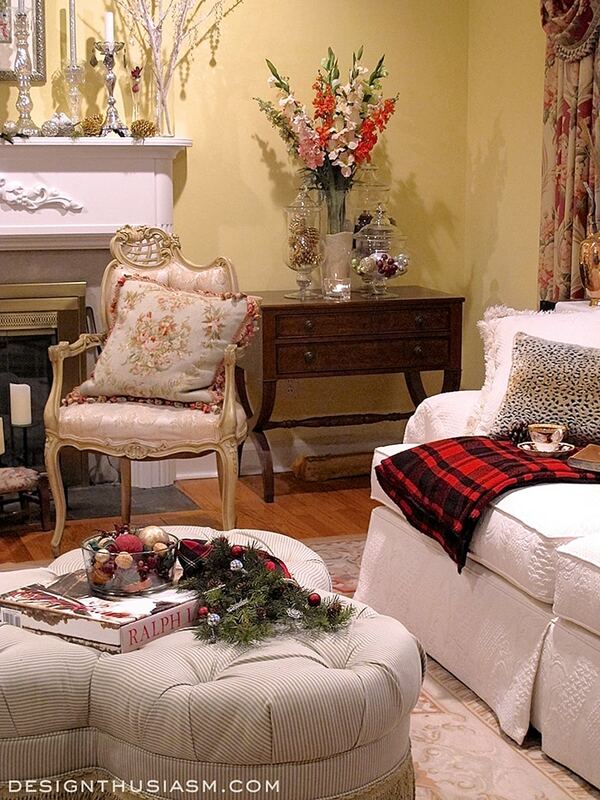 Of course the real focal point of this room is the fireplace mantel. 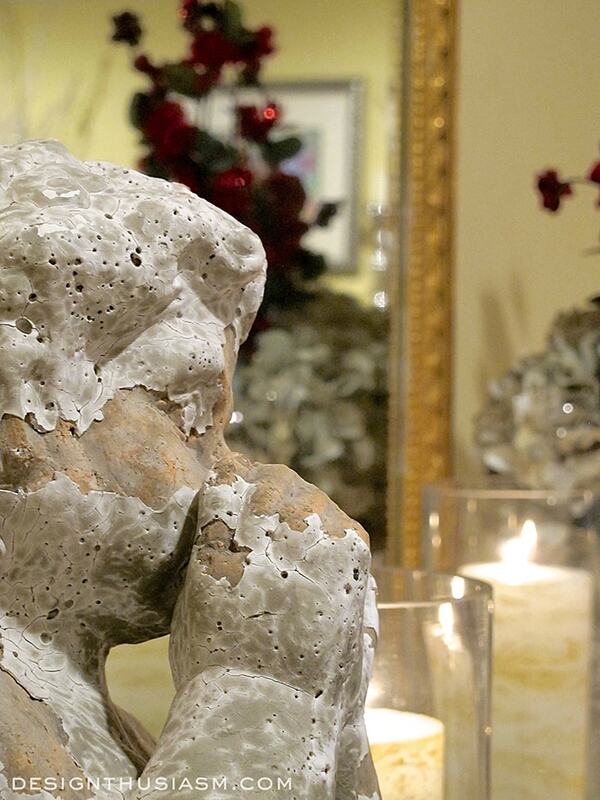 You can see all of the photos in the post Decorating a Holiday Mantel, but here’s a peek below. 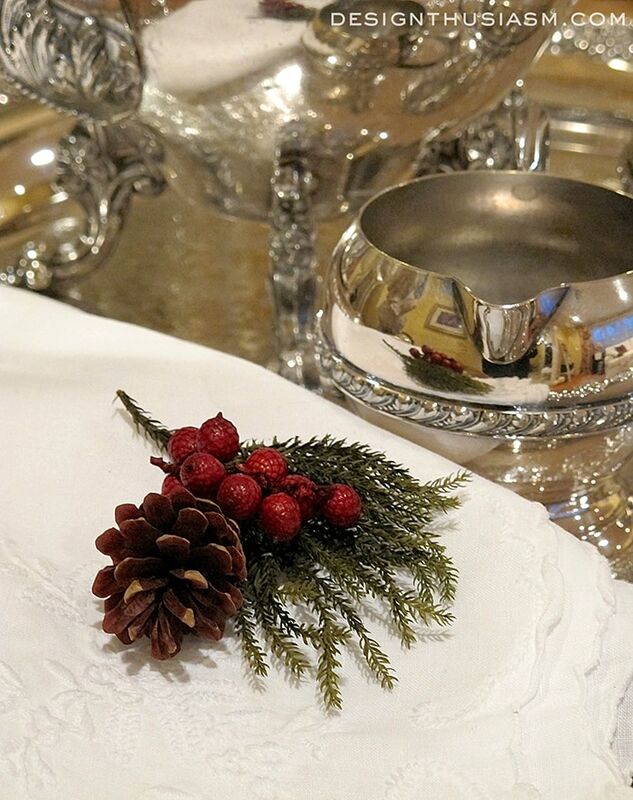 In the dining room you can see a table setting I created for a country French Christmas Morning Breakfast. Here’s a snippet of that one below. 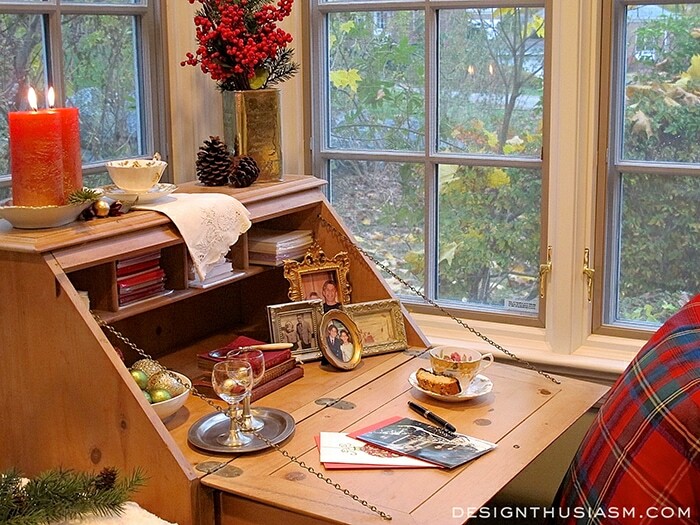 In my library I decorated my writing desk to get Inspiration for Writing Holiday Cards. Click on that link to see more. And finally I set a corner in my den for a Hannukah gift swap. 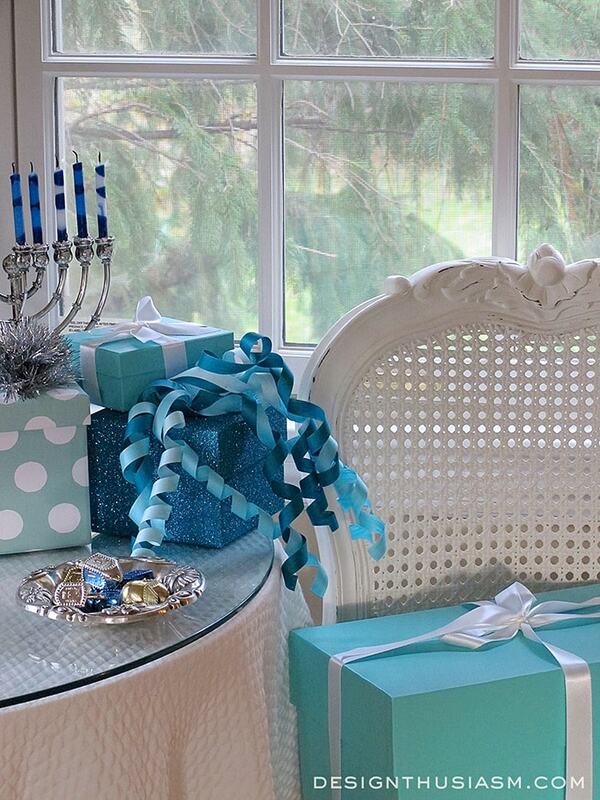 You can visit A Tiffany Blue Hannukah to see the details there. Still upcoming in the next few weeks will be my table settings for Hannukah, Christmas and New Year’s Eve dinners, so please stop back when you can. Or be sure to join the mailing list at the top of the page to ensure you don’t miss any posts. Thank you so much for visiting with me today!! Wow! Such a lovely holiday home. Thank you for sharing. My pleasure… 🙂 Thank you so much for your kind words and for stopping by!! 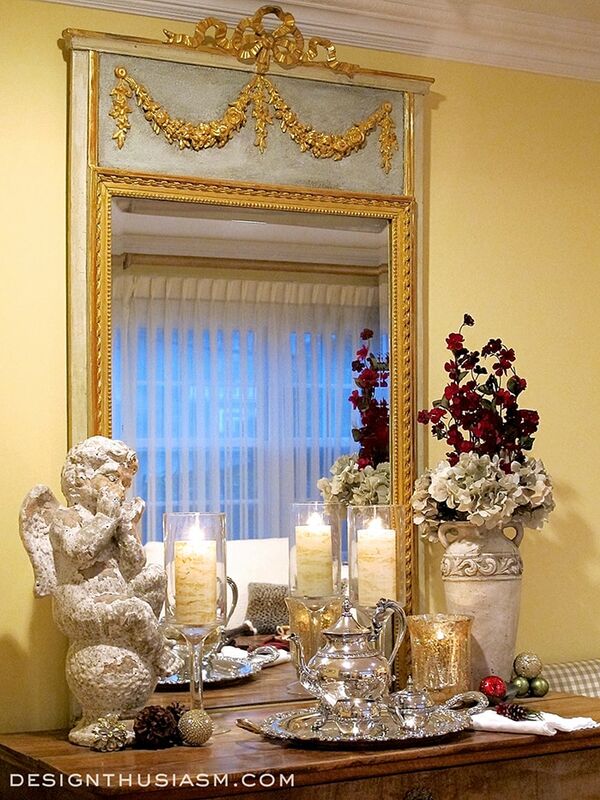 Lory, your home is beautifully decorated for the holidays! Your attention to detail is fabulous! 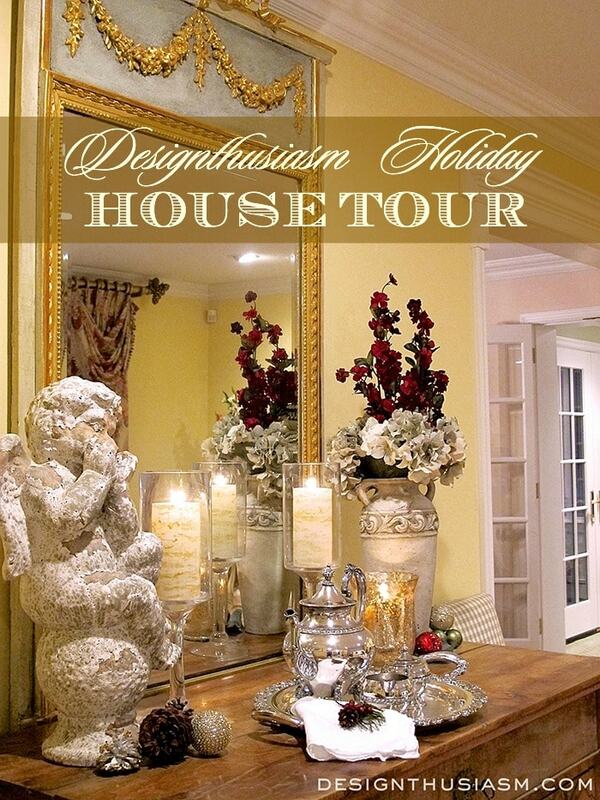 Wow, your Christmas tour is so opulent! Absolutely gorgeous! Thanks, Anne! I’m all about the glimmer… 🙂 (No one will ever accuse me of being understated… lol!) Thanks for visiting!! I love how you used the different metallics. Loving the gold and silver and reds. 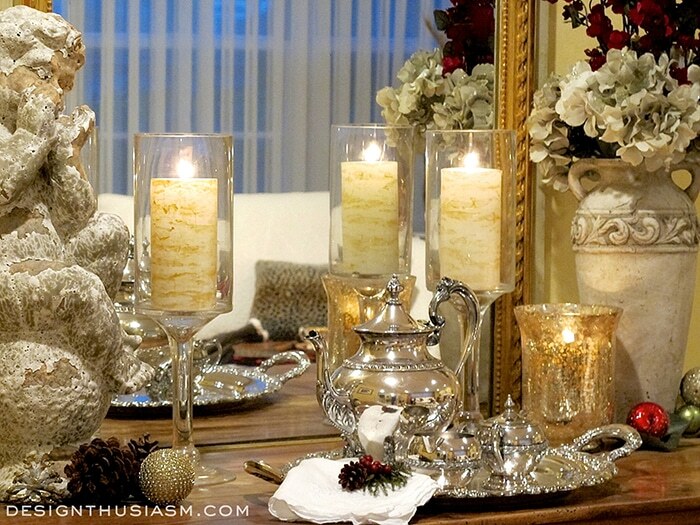 Lovely Christmas decor. Goodness, super beautiful, Lory. I’m following you as I can already tell we have much in common. Beautiful home and beautiful spirit. Happy Holidays, darling new friend. Thanks so much, Marsha! Yeah, I got the same vibe with one visit to your blog… 🙂 Happy holidays right back to you! Going to make sure I have you followed, as well (can’t remember if I did that earlier). Thanks for stopping by! Oh, thanks so much for stopping by, Kristin, and for the lovely comments!! Merry Christmas back to you!! 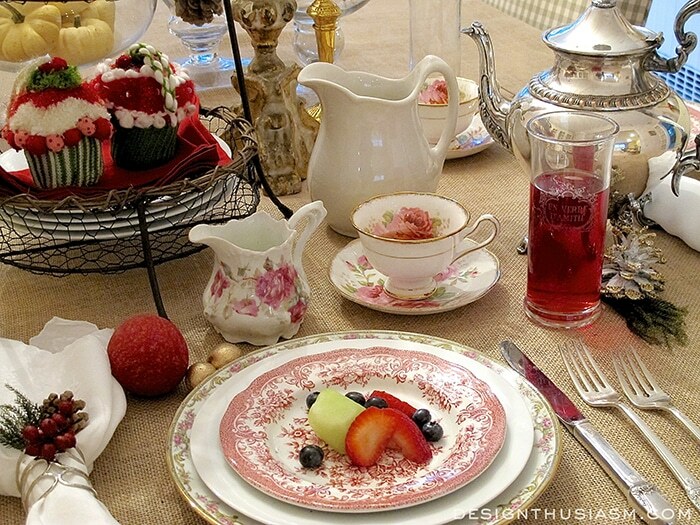 Such pretty tablescapes and mantelscapes you’ve created here. 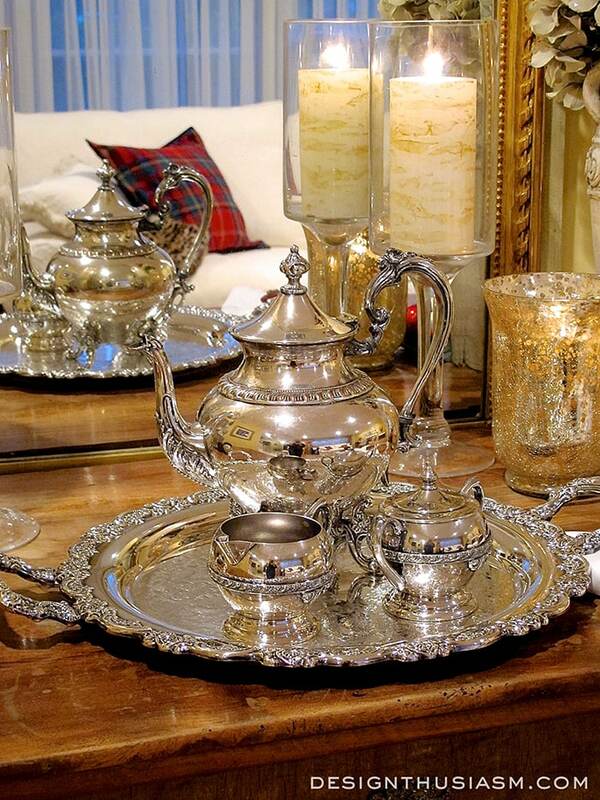 There is nothing quite like the sparkle of beautiful silver on the patina of warm wood. And you’ve done a marvelous job with the Chanukah decorations as well (such a great excuse to use the blue & white china, too). I’m staring at my messy living room and dining room (and stack of work files), and wondering how I’m going to manage to get this place “holiday ready” in the next 4 or 5 days. Other than one poinsettia picked up for Thanksgiving, I’ve done nothing so far. I’d like to blink my eyes à la Jeannie or twitch my nose à la Samantha to get the place in order – to then enjoy the pleasure of bringing the holiday sparkle to the fore. Thank you so much! Yes, my house is in a state of flux as well, with all the left overs from the shoots all over the place. I’m going to have to decide which way to go next and what to leave up (I don’t actually celebrate Christmas, but I had so much fun with the decor, I may leave it for a bit). I’m also getting ready to do a full Hanukkah table setting, so I may very well go the blue and white dish route. We’ll see how the spirit moves me in the next few days… 😉 Thanks for visiting!! You have such a lovely home! I love the tartans and the silver! Thank you so much Kathleen!! 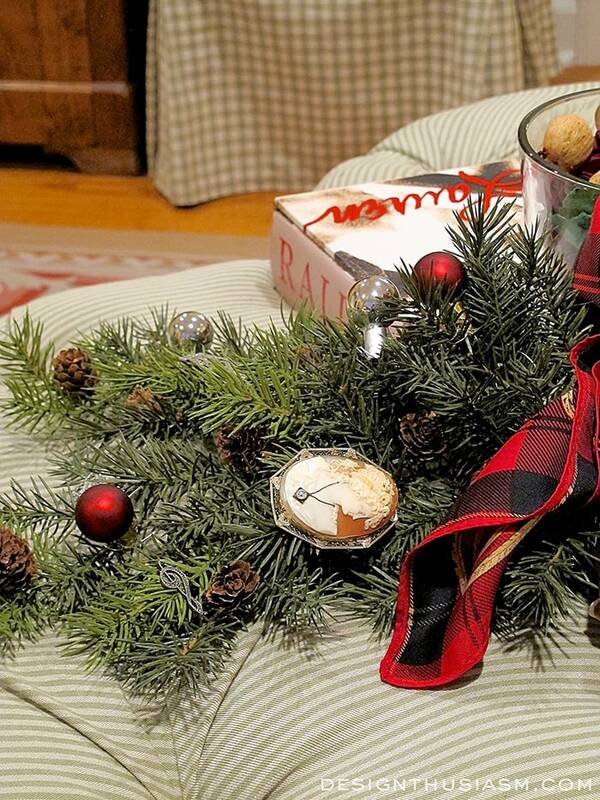 Was just thinking of doing tartan for a Christmas table setting. Will have to see if I can find what I want… 😉 Thanks for visiting! Everything is so pretty! The mercury glass and plaids are lovely. Thanks Barb!! Just switched up the mantle a bit today… 😉 Stay tuned… a little tweak revealed next week. Thanks for taking the time to comment! Love the cherub and blue presents the best. Wonderful tour, thank you! 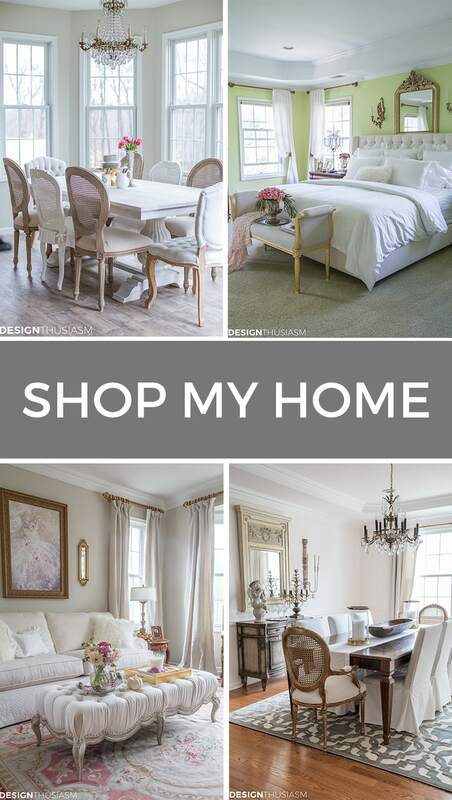 Your home is just lovely & thank you for sharing. wonderful to meet a kindred spirit! Thank you so much, Mimi, for such a lovely comment! It’s great to share with like-minded people… 🙂 Happy Holidays!! Everything is very beautiful! I love the pops of plaid here and there. 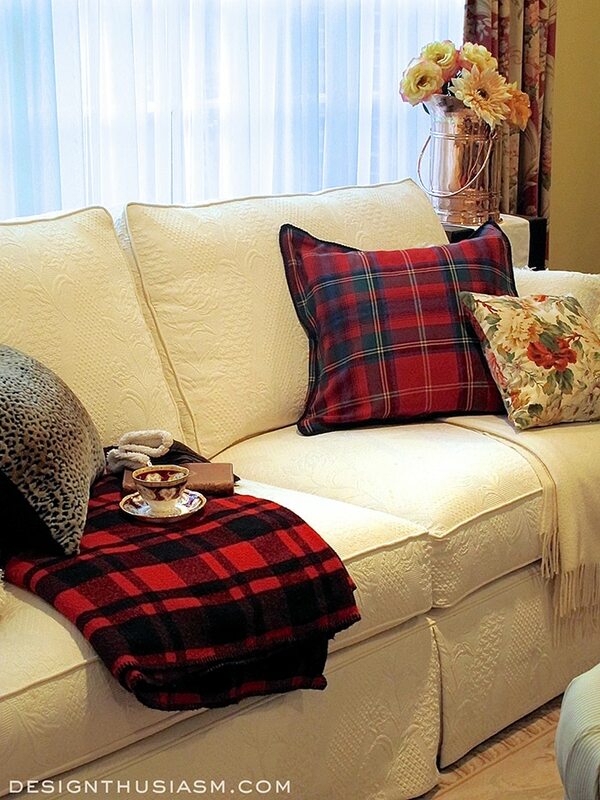 Plaid just screams cozy to me! Thanks for sharing with Creating Christmas. Thank you so so much for your delightful comment!! You have no idea what comments like this mean to me. Every time I get overwhelmed and feel that blogging takes too much time and energy, it’s wonderful to know that what I’m posting resonates with people. Welcome and take your time poking around… 🙂 Wishing you the happiest of holidays! !